The Flight Engineer monitors all aircraft engine and control systems during pre-flight, post-flight inspections and when flying. They must also be a jack of all trades when not at the home station and accomplish many of the aerospace maintenance, loadmaster and other functions that other Air Force specialists would normally do. Stressed Jobs List 2018-19: 115 slots for the 1A111 flight engineer field are available for re-training programs. Specialty Summary. Performs aircraft visual inspections and in-flight duties. Operates and monitors engine and aircraft systems controls, panels, indicators and devices. Manages flight engineer functions and activities. Related DoD Occupational Subgroup: 050. Performs aircraft inspections. Performs aircrew visual inspection; non-scheduled aircraft maintenance; and preflight, through-flight, and postflight inspections of aircraft away from home station. Maintains aircraft forms and records during flight and while aircraft is away from home station. Computes and applies aircraft weight, balance, and performance data. Computes hover, takeoff, climb, cruise, and landing data. Determines engine fuel consumption using airspeed, atmospheric data, charts, computer, or electronic calculator. Records aircraft performance data and aircraft system status for maintenance debrief and aircraft usage analysis. Operates and monitors engine and aircraft systems controls and indicators. Assists pilot or performs engine starts, and monitors run-up, flight operations, and engine shutdown. Operates engine controls to provide desired efficiency and economy. Monitors engine instruments throughout period of operation. Controls, monitors, and regulates some or all of the following aircraft systems, hydraulic, pneudraulic, fuel, electronic, air conditioning, pressurization; ventilation; auxiliary power unit; and lubrication communication, navigation, countermeasures, radar, and depressurization and system failure. Observes warning indicators and light for fire, overheat, depressurization, and system failure. Reports abnormal conditions to pilot, and recommends corrective action. Helicopter qualified personnel may be required to perform duties as aerial gunner, rescue hoist operator, hover coupler operator, fast rope and rope ladder deployment or recovery operator, scanner, and cargo sling operator. Plans and organizes flight engineer activities. Organizes flight engineering standardization, qualification, and other requirements of flight engineer logs, reports, and records for accuracy, completeness, format, and compliance with current directives. 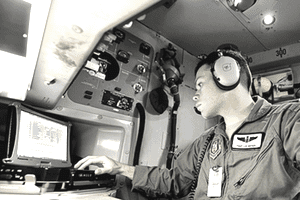 Coordinates with other agencies and organizations to conduct flight engineer activities. Directs flight engineer activities. Administers qualification flight to personnel engaged in flight engineer activities within flight test and operations organizations. Directs standardization of flight engineer performance in conjunction with aircraft performance engineering, engine conditioning, and preventive maintenance programs. Ensures conformance with prescribed aircrew procedures. Inspects and evaluates flight engineer activities. Evaluates individual and group performance in terms of effectiveness and qualification in using equipment and materials. Interprets and discusses evaluation findings, and recommends action to correct deficiencies. Performs technical flight engineer functions. Resolves technical problems encountered by operating units. Renders advice and technical assistance to agencies engaged in functions associated with flight engineer activities. Advises organizational commander or staff agencies on status of flight engineer activities and adequacy of equipment. Maintains qualification in aircraft. Knowledge. Knowledge is mandatory of: electrical, communication, navigation, mechanical, hydraulic, and pneumatic systems applying to aircraft and related systems; flight theory; minor in-flight maintenance; personal equipment and oxygen use; aircraft emergency procedures; and using and interpreting diagrams, schematics, aircraft performance charts, loading charts, technical publications and flight manuals. Education. For entry into this specialty, completion of high school with course in mechanics and mathematics is desirable. 1A131B. Completion of a helicopter flight engineer course. 1A131C. Completion of the basic flight engineer course. 1A151. Completion of an appropriate flying training course. Experience.The following experience is mandatory for award of the AFSC indicated: (Note: See Explanation of Air Force Specialty Codes). 1A151. Qualification in and possession of AFSC 1A131B/C. Also, experience is mandatory in functions such as aircraft and performance weight and balance computations, aircraft records maintenance, and aircraft systems maintenance and inspections. 1A171. Qualification in and possession of AFSC 1A151. Also, experience is mandatory in performing or supervising functions such as flight engineer activities. 1A191. Qualification in and possession of AFSC 1A171. Also, experience managing flight engineer functions and activities. Special Note: This job used to be closed to new recruits, unless they already possessed a valid Federal Aviation Administration (FAA) Flight Engineer Certificate. However, the Air Force has changed this policy, effective sometime in January 2003. The job opportunity is now open to new recruits (1A131C only). Added note: According to this article, from the Air Force News Service, the Air Force has stopped taking non-prior service into this career field, regardless of shreadout, starting in November 2006. For award and retention of AFSC 1A131X/51X/71X/90/00, eligibility for a Secret security clearanceaccording to AFI 31-501, Personnel Security Program Management. For 1A131C: Prior qualification at the 5- or 7-skill level in the 1A0, 1A2, 1A5, 2AXXX, or 2M0 career field ladder, or possession of a valid Federal Aviation Administration (FAA) Flight Engineer certificate, FAA private pilot license, or valid FAA aircraft and power plant license or Aircraft Maintenance Technician license. Shredouts B and C are applicable to the 1- and 3-skill levels only. (Helicopter Flight Engineers): Non-Parachuting Water Survival Course, Fairchild AFB, WA, 2 days. Additional Training & Career Field Information.